Volcom Stone presents: "Why Do You Keep On Hurting Your Neighborhood? What's Wrong With You?" If you're an artist and a legit Filipino citizen, be the one to shout out "Why are you hurting your neighborhood? What's wrong with you?" -A Php 10,000 shopping spree of Volcom stuff from Aloha Boardsports. 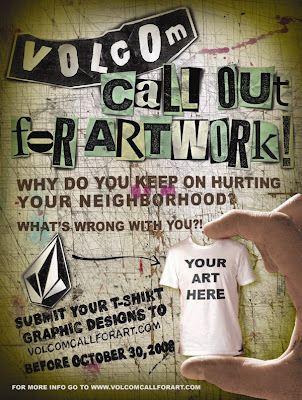 Upload your piece to http://www.volcomcallforart.com using the registration form found in the site. You will receive a confirmation email acknowledging receipt of your entry. All artwork must be in before midnight of October 15. Results will be out by the 2nd week of November so start working on your all-original piece now, 'cause you just might be the next Volcom Featured Artist. 1. The contest is open to Filipino citizens of any age but should be residing in the Philippines. 2. Participants may submit multiple entries. 3. Qualified entries must be a response to the contest theme: "Why are you hurting your neighborhood? What's wrong with you?" Message is broad, encompassing social, environmental, political and economical issues. 6. Entries must be submitted through the website http://www.volcomcallforart.com using the registration form found in the site. The participant will then receive a confirmation email acknowledging receipt of the entry. 7. Submission of entries is from September 1 to October 15, 2008 at 12:00 midnight. 8. Artwork will be judged by Volcom. 10. The Winner will be announced via press releases and through the website not later than November 15, 2008. 11. The Winner must submit the actual hard copy of the winning piece upon claiming his/her prize. 12. By joining this contest, the participant shall guarantee that any or all artworks submitted are original artworks conceptualized and created by the sender. 13. The Winner must also agree to participate in any media interviews and pictorials that may be required of him/her as a result of winning this contest. 14. All submitted entries along with its components become property of Aloha Boardsports Inc., and may be used for promotional, publicity, advertising purposes with or without consent from the sender. 15. All employees of Aloha Boardsports Inc., GeiserMaclang Marketing Communication Inc., Creative Juice Communications Inc. and other promo partners/third parties, including their relatives up to second degree of consanguinity or affinity, are automatically disqualified from joining the contest.